Tides Marine, located in Deerfield Beach, California has been providing the marine industry with integral components since 1999. With their fully-operational machine shop, the facility is able to completely customize their parts to suit any and all customer needs. Tides Marine strives to be the premier global brand choice for customers in the marine industry. Since their establishment, they have been moving steadily towards their role as industry leader, thanks in part to their innovative design and technology use in their self-aligning drip-free SureSeal shaft seal system. Deep Blue Yacht Supply is the industry leader when it comes to providing Tides Marine SureSeal systems at the lowest prices. Tides Marine designs and builds in cohesion with the regulations of the ABS (American Bureau of Shipping). They are a member of the ABYC (American Boat and Yacht Council) and an ISO-certified (International Standards Organization) facility. Tides Marine's success in terms of innovative design and performance is exemplified in its SureSeal self-aligning drip-free bearings and seals for propeller shafts and rudder assembly. This full line has sold thousands of units and is used by more US boat builders than any other brand. The SureSeal system has determined the industry standard in shaft seals. The SureSeal customer base includes sail boats, yachts, power boats, and commercial craft. The SureSeal is compatible with propeller shaft sizes from 1" to 8". The shaft diameter, stern tube's OD, and the amount of room between the stern tube's end and coupling is the only information needed for install. Some of the system's key features include minimal maintenance, ABS approval, the benefit of a replaceable lip seal when in water with the spare seal carrier, and ease of install. The shaft seal's housing, made from fiber-reinforced composite material, is condensed, hard-wearing and strong. It will not absorb water and is temperature-resistant. The ease of install to the vessel is easier than ever with the articulating hose design automatically aligning the SureSeal the necessary distance from the stern tube. With no need for measurements, installation could not be simpler or more efficient. Additionally, each component is backed by a two-year, or 2,500 engine-hour, warranty. Tides Marine has built a steadfast reputation based on their ability to provide a variety of boats and boat builders with unparalleled customer service. Thanks in part to the success of their water-tight self-aligning SureSeal system, Tides Marine is moving steadily towards their goal of becoming the premier brand of choice within the marine industry. Tides Marine designs and manufacturers a full line of self-aligning Drip Free shaft seals and bearings for propeller shaft and rudder assembly applications. Sail Track and Hardware Systems make mainsail-handling problems all but disappear. These innovative, high-quality products improve vessel performance and reduce the need for scheduled maintenance. With tons of units sold, Tides Marine SureSeals are used by more US pleasure boat builders than any other marine seal. The new Tides Marine SureSeals has redefined the standard, offering numerous shaft seal design and performance improvements. Tides Marine builds and designs to ABS (American Bureau of Shipping) Standards and is a member of the ABYC (American Boat and Yacht Council). Tides Marine is an ISO (International Standards Organization) certified facility. Tides Marine is working to become the global brand of choice for the customers we serve. As a marine industry leader in the effective use of technology, Tides delivers unmatched, reliable service to boat builders, yards, lofts and vessel owners. 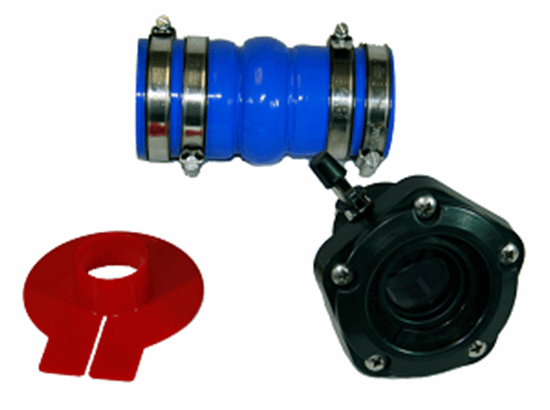 Deep Blue Yacht Supply is the standard in the industry when it comes to providing Tides Marine shaft seals and isoflex couplers. If you have any questions on any Tides Marine product, reach out to the Marine Shaft Seal experts at Deep Blue Yacht Supply.